Harris Web Works (formerly Medium Well) can help define your goals for online advertising. This includes a competitive analysis of which channels align with your goals, carrying out an online advertising campaign, Google Adwords campaign management, pay-per-click management, remarketing programs, and analyzing the results. Harris Web Works can help you identify the most appropriate channels for your business type, goals and budget, create ads incorporating your branding and messaging, and manage an ongoing, evolving campaign. Online advertising is much more fluid and dynamic than simple print ads. Online ads can and should be precise in who they target, going only to viewers based on location, age, interests, or other demographics relevant to the business. Most businesses structure and pay for online ads in one of two ways: pay-per-click advertising or fixed rate advertising. Pay-per-click (PPC) is paying for an ad based solely on the amount of clicks it gets. A business can post multiple versions of the same ad and quickly see which gets the most clicks and make changes as needed. This is effective for those with a strict budget, as spending limits can be preset. Fixed Rate is when businesses pay a set price for ads up front, and is used often on content-focused sites where the target audience is likely already there. In both cases, the ‘click’ goes to the business’s homepage or a content-specific landing page. Google Adwords > These ads appear on Google search result pages, on the side, for businesses pertaining to the search criteria and accounting for the demographic parameters. These are usually PPC ads and are effective for campaigns based on specific keywords. Search Ads > These are similar to Google Adwords, except these ads appear as search results (usually top results) instead of on the side. 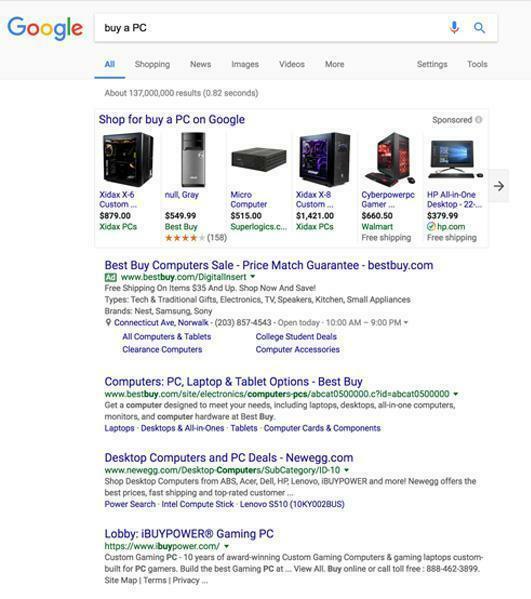 This example shows how ads appear ahead of organic search results for search criteria of “buy a PC”. Google Display and Content Networks > Also similar to Google Adwords, these ads go on sites related to your business. You can use both text and images, and they let you remarket your site to past visitors. 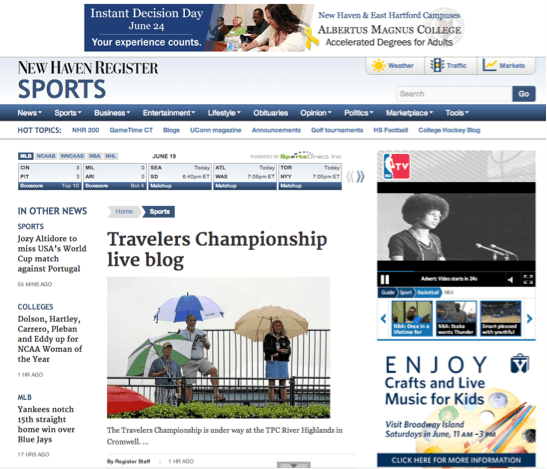 Display Ads > These are classic ads, such as banner ads, that are distributed to several different related websites. Instead of waiting for users to search certain terms, they automatically appear on sites where users who may be interested likely visit. This example shows a regional newspaper’s website with display ads for local businesses on the top and right. Social Media Ads > These are paid ads on social media sites such as Facebook and Twitter. These can be bought and sent to users based on data the sites collect and are especially effective if your business already has a strong social media presence. Learn more about Social Media Marketing here. Business Directories > Sites like Yelp are built around helping people find new businesses, and are now necessities for reaching curious customers. Many businesses make premium accounts so they appear higher on searches in the site, and can highlight good reviews. Yahoo Bing Ads > Similar to Google Adwords and Google Display ads, except they’re on the Yahoo Bing network, which may be where more of your customers are. Google Adword campaigns can even be imported here to save time. Something else to keep in mind is the process of remarketing to or retargeting people who have visited a site but didn’t become a buyer. It’s the process of tagging key phrases on your website and placing a cookie in the user’s browser history, so after the user leaves your site, your ads will appear on other sites they visit, as a reminder about your products or services. Online marketing is a comprehensive marketing approach that includes having an effective website, plus social media, search (SEO and SEM), paid advertising, email, content strategy and analytics. In terms of content, a website is the core component of an online marketing program, with a strong presence in social media and online directories increasing in importance. Activities related to searches and advertising provide the mechanics to get your content noticed.